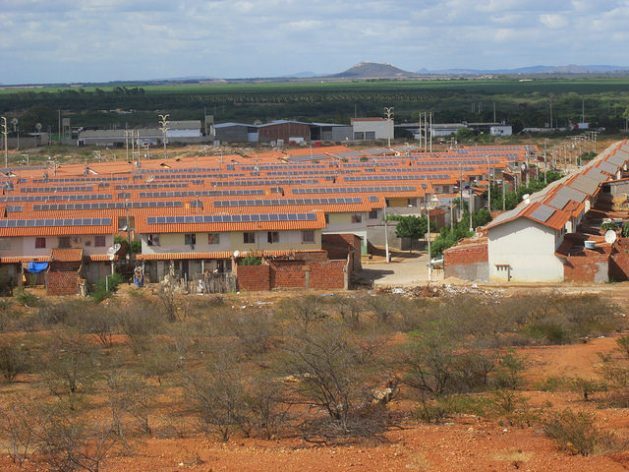 JUAZEIRO, Brazil, Jun 26 2018 (IPS) - “Our main challenge is to get the project back on track,” agreed the administrators of two affordable housing complexes, where a small solar power plant was installed for social purposes in Juazeiro, a city in northeast Brazil. 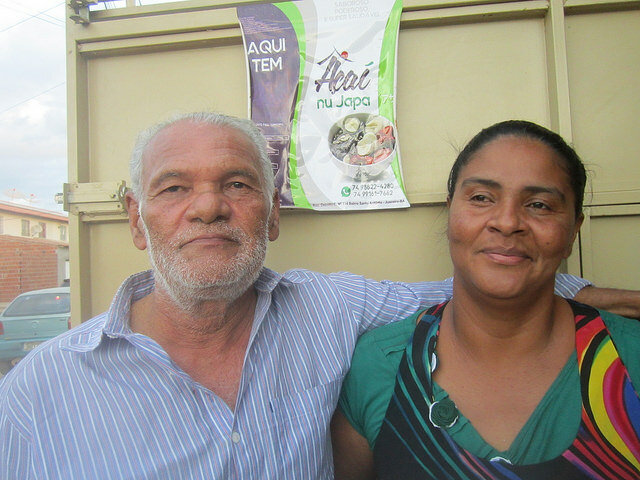 Gilsa Martins, re-elected for the third time to a two-year stint as manager of the Morada do Salitre housing complex, and Marinalva Rodrigues, newly elected in the Praia do Rodeadouro condominium, pledged to fight together to rescue the project for their neighbourhood. The two complexes are home to 1,000 families living in poverty, who managed to free themselves from paying rent, which was money they needed for food. In addition to the houses, which they obtained thanks to subsidised financing, they benefited for a while from the income generated by selling electricity. On the rooftops of the 174 two-story four to six-unit buildings, 9,144 solar panels were installed, with a capacity to generate 2.1 MW, which can meet the demand of 3,600 homes with a low level of consumption, leaving a significant surplus. This meant for each resident an average monthly income of 49.70 reais (about 18 dollars at the then exchange rate) between February 2014 and October 2016, according to data from Caixa Economica Federal (CEF), the state bank that supports social policies, which financed the Energy and Income Generation project. For most of the families, this amount covered the monthly installments of the loan with which they purchased their homes in 2011, granted by the government’s housing programme for low-income families “My House My Life”. The two complexes make up a village, which has yet to be named, located 14 km from the centre of the city of Juazeiro, in the state of Bahia, in the northeastern region of Brazil, on the bank of the São Francisco River. The city of 220,000 people is a large producer and exporter of fruit and receives abundant sunlight, which favours solar energy. “It was a wonderful project, important for the community,” which financed the construction of two community centres, computer and soccer courses, medical and dental care, Martins said. “We trained many young people who are now employed,” she said during an interview with IPS in the town. “With the public authorities practically absent, we did everything on our own, planting trees and cleaning the streets, building bus stops and speed breakers for the vehicles, taking care of safety,” and all of that represented paid jobs for residents of the housing complexes, she explained. The main achievement of the project was, perhaps, “to promote social organisation, a sense of belonging,” an original objective of the initiative, together with the generation of income, according to the CEF, whose Socio-environmental Fund made it possible for the idea to be implemented by donating three million dollars. This is generally lacking in the My House My Life settlements, which are almost always built far from the city, from urban services and sources of employment. This has turned them into drug trafficking and crime hotspots. 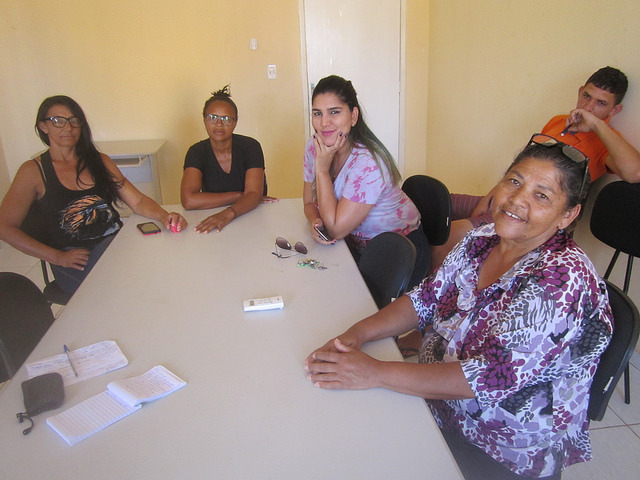 For this reason, a pilot project was conducted in the two Juazeiro complexes which, if successful, would be replicated in other low-income housing complexes, as a factor of social stability and reduction of poverty for the beneficiary families. But the solar project was interrupted in this community of the municipality of Juazeiro, in October 2016, by a measure taken by the National Electric Energy Agency (Aneel). The regulatory agency claimed that the project did not comply with the current rules for electricity generation by consumers. It was implemented with a special three-year permit after which it was to be “brought into line with the regulations,” according to an October 2013 Aneel resolution. This is because the project, designed and implemented by the company Brasil Solair to generate income, was based on the sale of energy, something that is not allowed in Brazil under the “distributed mini-generation” category, which covers power plants with a capacity of between 75 KW and five MW. This decentralised mini-generation can only produce for self-consumption, and the surplus energy is injected into the grid, in exchange for a discount on the electricity bill, whether of a household, a business or institution, or for accumulated credit in the months when production exceeds consumption. Brasil Solair, the company that designed and implemented the project, tried to obtain an extension of the exception, while maintaining the same design and transferring the surplus credits to third parties, which is prohibited by Aneel. For the Morada do Salitre and Praia do Rodeadouro housing complexes it is difficult, if not impossible, to adapt to the current regulations. Their generating capacity is approximately 3.6 times the consumption of the 1,000 households. Adapting to these standards requires large investments, as it would involve dividing the joint generation of the 1,000 units, with the installation of individual metres to measure contribution and consumption. A clear arrangement for using the surplus energy would also be needed. Aneel points out that since 2016 it has allowed alternatives such as “shared generation”, in which different stakeholders can form cooperatives or consortiums and “ventures of multi-consumer units”. But none seems to fit the case of Juazeiro, which is included in the second option but with a surplus capacity. In addition to the question of how to take advantage of the surplus, the issue of the resources that the project generated to cover the cost of community projects remains unresolved. Of the net income produced by the solar panels, 30 percent went to the community and was used for vocational training and various services. Another 60 percent was equally divided among the 1,000 families and 10 percent was used for the maintenance of the panels. The search for solutions to resume the project is a focus of the efforts of the two administrators and of David Lima, a social activist who, after leading the homeless movement in northern Bahia and advising several politicians and mayors, lives in retirement in the house that his wife, Aedna Carvalho, obtained in Morada do Salitre. The couple set up an ice-cream stand in the front yard of the house, in an initiative similar to that of many other neighbours. 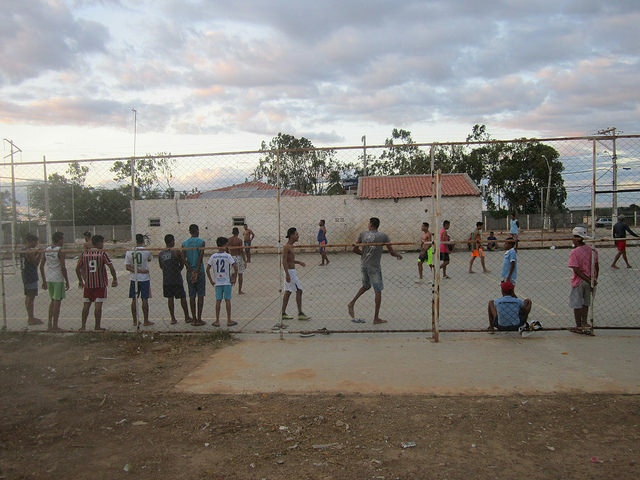 “We want back the project that benefits 1,000 families, although the monthly income it generated for each family at one point reached 124 reais (52 dollars at the time) and in the end it was only paying six reais (1,70 dollars),” said Lima. In May, the activist, who writes every day in his blog, accompanied Martins to Brasilia, in an attempt to obtain support for the reactivation of the solar plant from Environment Minister Edson Duarte, who happens to be from Juazeiro. “The project ran up against a wall of red tape in Brasilia,” said Julio Martínez, a Chilean who has lived in Brazil since the 1980s, and who helped implement the project as social development manager of Brasil Solair. The most enthusiastic participant in the solar project appears to be Lucineide da Silva, a mother of eight who was a homemaker until at the age of 40 she became the leading installer of solar panels on the rooftops in the communities, among the dozens of workers trained to carry out that task. Known as the “Galician of the panels” because of her light skin and blonde hair – typical of people from that northern region of Spain – she was one of the two women chosen to carry out maintenance of the equipment. “I fell in love with the project, it’s my life,” she said, adding that she hopes it is revived. Not everything was a bed of roses. Because the surplus electricity was sold on the free market, the price varied greatly, angering local residents and even leading to attacks on the administrators. The transparency in the presentation of the accounts did not prevent them from being accused of stealing. It was a very difficult task to explain the complexity of the Brazilian electricity industry to the low-income residents of the communities. This led to the resignation of Marinalva Sobreira as administrator of the Praia do Rodeadouro complex, at the end of her term in 2016, as she was suffering from hypertension and taking medication to deal with anxiety.